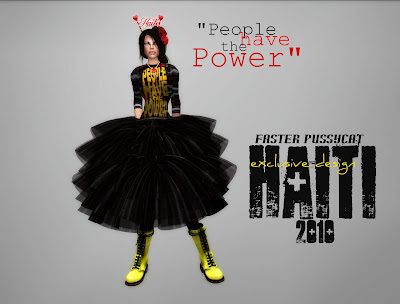 New Faster Pussycat video by Coeur Auer! I started todays post with a quote by one of the most legendary women of the 20th century - Coco Chanel as I am currently hard at work writing a book about her in RL. Seems this month has been a month full of fashion with the IFW 2010 running 4 shows per day for 4 days. There is every reason deem Faster Pussycat's show on Saturday 17.th a great successs - the Glance models did a beautiful job with the styling (of which I am rather picky) and the DJ worked my very spesific and ecclectic playlist perfectly. The result was great, the show really stood out and I would just like to take the opportunity to thank everyone at Glance, all the awsome bloggers who's featured our designs on their blogs and of course the enthusiastic public. Here I've added a photo of myself outside our store at GIA's IFW 2010 sim - here I am proud and excited before the opening last week. Now all our new releases are available in Faster Pussycat's mainstore in Redux. 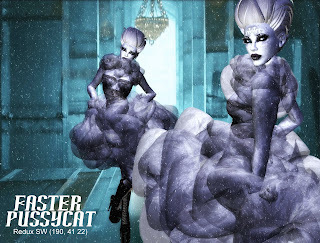 Here's a new video of Faster Pussycat's designs showcasing supermodels Wicca Merlin and Accacia Brissot. The video was shot by Coeur Auer and can also be seen on the wall in my mainstore. "Americana" is a cute retro rockabilly dress in red with white polkadots from Faster Pussycat, currently available at the Haiti Relief Fair Project tents. You get a halterneck swimsuit with a matching big swing skirt - to take you straight from baking on a hot beach at noon to a rockin' beachclub at night. Icluded is a purrty red flower for your hair. 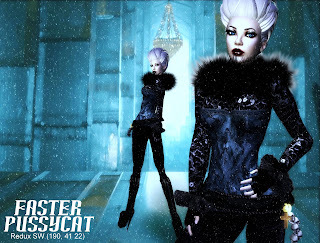 New elegant gown from Faster Pussycat is available in mainstore now. Can be worn with or without the transparent flowing scarf on top. Perfect for hot summer nights and walks along the beach. It brings me such joy to be able to bring you the Pose Fair news from one of SL's top pose and photographer's props creator - namely Chandra Meehan, and (*chanimations. I have loved her stuff for ages and even won several photo contests with them so naturally I was very curious to see what she has come up with the fair. I was not dissapointed. Chandra has created to awsome new multi functional props - "Exorcism" and "Source of Life", two full scene builds with many many functions, from throwing spells to binding your victims and releasing soap bubbles and fire (!!) Of course these will enable you to shoot some truly magican photos, but kept up in a sim the props can also very well functrion as a great RP set for you and your friends. OK, "Exorcism" first. This set is structured in multiple layers, it can be used as a one-person-pose, couple pose set or if you have more magic followers at hand - let them join the outer circle of another 10 poses that surrounds the alter in a summoning. The rituals you can playe with these doesnt dare mentioning lol but your mind is the only limit. As you can see I took the opportunity and chained my possessed friend lol and bound an additional sinner at the side of the altar while I wrestled with the nassy demons. Then theres the lovely "Source of Life" set - a spring celebration. All POSES are static and come with copy rights so you can put them into your posestands or make own poseball arrangements. Lovely for creative fashion shoots as well as more occult visuals. I LOVE these props. I'm currently working on my new spring and summer line Seriously Cute that's why I'm such a recluse these days. But I thought I'd post a preview so you can see I'm actually working, not just saying lol. We're expanding the store, have a whole new floor and will also be featuring shoes and accessories. Seriously Cute plus another more spectacular line of gowns and catsuits should be out in the store after Easter holidays. Enjoy! I remember a time when Hair Fair was the big event of the year, in fact many would argue that it still is apart from getting caught in a massive soup of lag. Last Hair Fair i had to cancel, not even flying around like a naked noob helped because not only was there hoards of people but nothing rezzed and if it did it was buildings made of allsorts and cupcakes, not the actual vendors! Cute idea, but unless you have a kickass pc like the Linden Labs you're in trouble. It was also quite unpleasant to hear idiots yell at people for their rendering cost. It is annoying that someone flies in with a scripted outfit and hair that could take out a SIM but be civil. Anyways, so now we have had Skin Fair, Clothing Fair and Accessory Fair is still going on, it was only ehem fair? - that we should have a Pose Fair. Og btw - is there a shoe fair? It's the brainchild of Katey Coppola of Glitterati, and to fight the aforementioned lag they are going to keep the building minimalistic. To quote Evelyn Harsthon on their flickr: Quaduple yay for that! I will most def be spending a bunch of my hard earned lindens here so I'll blog some of the poses with Faster Pussycats designs as I go along. 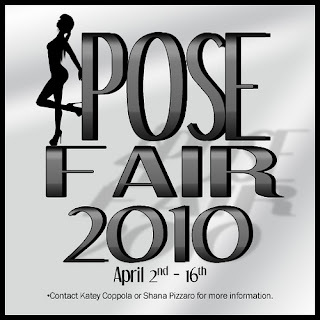 Pose Fair will run from April 2nd until April 16th. I just had to post this lovely photo of Mimmi Boa and Poptart Lilliehook on the Glance runway wearing Faster Pussycat's winter collection "A Winter Fairytale". Mimmi (left) is wearing Winter Vamp in turqouise and black sequins and fur, Poptart is wearing The Ice Princess in glacier white. I just love the styling and the poses, which goes to show why some models are so-called supermodels. Great work, Mimmi and Poptart! I see these gowns as a whole new take on power dressing - with our creativity we have the power to change some wrongs to rights - and the words I chose to print on the dress were inspired by an old song by Patti Smith. I have loved creating this dress, it is is kinda punky and wild, with a bit of 80ties pop video thrown into the mix. The hearts in the tiara and the little collar symbolizes love and empathy. The big skirt symbolizes haute couture - as this dress is a one-off - and the stripey tights and top symbolises unity, strenght and hope. The top even has the words "HOPE" printed on the back. Tops and bottoms are in all layers for easy wear and without the big skirt the catsuit can easily be worn under your fave denim miniskirt or booty shorts for a more casual look. The idea of a full bodycatsuit is warm, cocooning comfort - just what every human being needs, but especially the little children of Haiti who are suffering twice as much as everybody else with the threat of human trafficking lurking in addition to the traumas of the disaster and loss already. God bless whomever bought my dress, you are helping save lives. If you didn't get a chance to come to this auction don't panic - there's more comming up in the months to come. Glance International are having a Relay for Life show and so is Opium. And I think Faster Pussycat will contribute to both if I get enough time. I will post more details soon as I know. See you there!